What the T-Rex is to dinosaurs, the Great White is to sharks—the top-of-the-food-chain granddaddy of them all. 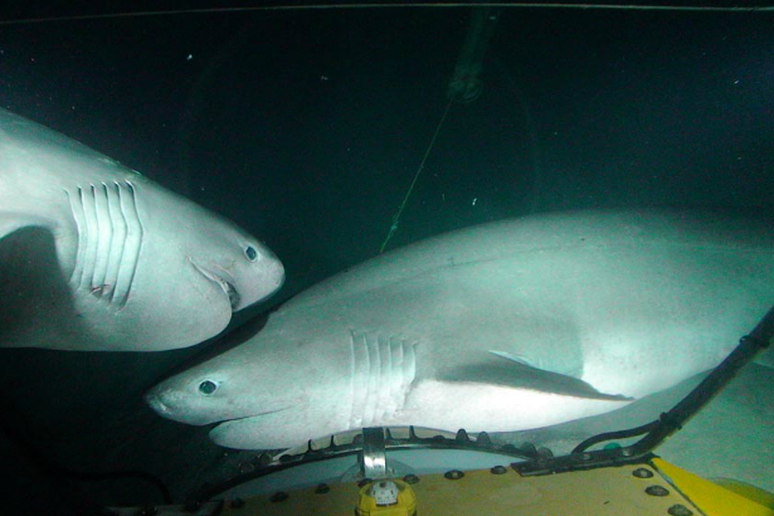 These toothsome carnivores grow up to 5,000 pounds and 20 feet long; they are the largest predatory fish on Earth. That’s why it’s safest to view them from within the confines of a cage. If the company’s track record continues, you can expect to see seven Great Whites on a five-day cage-diving trip with Great White Adventures. 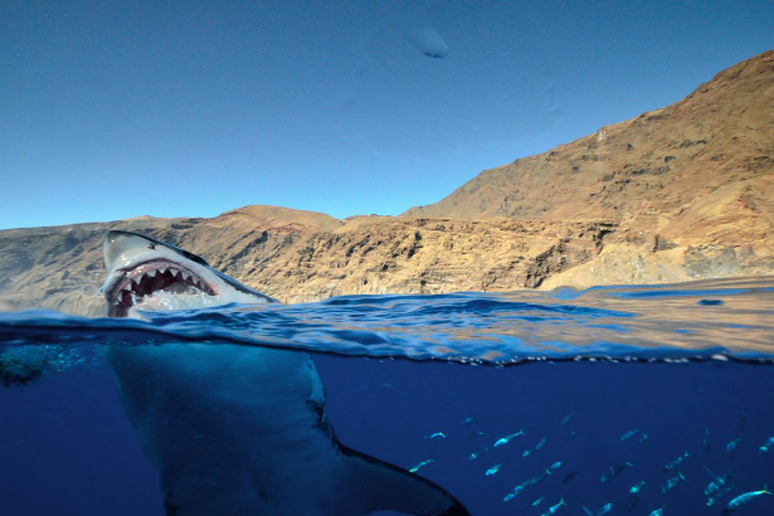 Excursions are offered from August through October in the warm, crystal-clear blue waters (some of the best in the world for viewing Great Whites) off of Isla Guadalupe, near Mexico’s Baja California coast. Dubbed the peregrine falcons of the shark world for their torpedo-like bodies, Shortfin Makos are the fastest of all sharks. Many can cruise along comfortably at 22 miles per hour, and one was clocked swimming a bullet-like 46 mph. They can even leap up out of the water, up to 20 feet in the air. These athletic creatures are most commonly found in warmer waters. San Diego-based Shark Chums runs regular diving trips out to the Mako-filled waters off of southern California. These 6.5-foot-long predators are one of the most common sharks in the Indo-Pacific. They’re most often found in shallow waters, in lagoons and near coral reefs, so swimming alongside them also means spotting plenty of other interesting sealife: colorful fishes, turtles and anemones. Maldives Dive Travel has a fleet of 11 live-aboard dive ships and offers multi-day excursions for spotting Grey Reef Sharks. The prehistoric Six-Gill Shark is a deep-sea creature that dwells up to 6,000 feet below the ocean’s surface. Little surprise, then, that spotting one of these 20-foot-long fish is a rarity. But on one of Shark Diver’s unique submarine-based dive excursions, you can venture 2,000 feet beneath the sea into the Cayman Trench off of Honduras, and spot massive Six-Gills in their native habitat. Shark Diver’s specially designed submarines carry up to three people for six-hour dives. Call them Miss Congeniality. With their silvery skin and dark oval spots, Leopard Sharks are among the prettiest of the finned fishes, and they’re some of the most people-friendly, too. In aquariums, Leopard Sharks are often those on display in interactive aquariums, in which little kids can touch the four- to seven-foot-long creatures. They’re often found in shallow waters or reef areas. You can spot some off the coast of Australia, in the Coral Sea, on a six-day sailing-and-dive trip with Undersea Explorer. Don’t let those sharp teeth fool you: Tawny Nurse Sharks are so docile, they often let divers come right up and touch their fins. They’re found in the Indo-Pacific region, and their friendly, curious nature is one reason diving is so popular in the waters off of Thailand and India. Their name comes from their ability to vacuum up fish and crabs out of reefs, using a powerful sucking motion with its throat—just like a baby nursing. They grow up to 10.5 feet long, and their skin color fluctuates between gray and brown, depending on their surroundings. Wicked Diving offers day trips to the nine granite Similan Islands for spotting Tawnies. 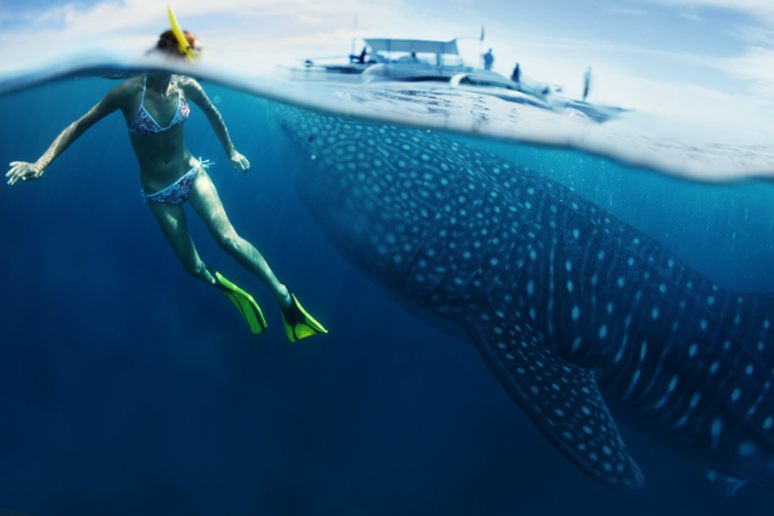 What better way to celebrate the official Mexican Day of the Whale Shark, on August 30th (yes, it is an official holiday), than by snorkeling alongside these gentle giants? They may be the biggest fish in the world—at up to 40 feet long and weighing in at 50 tons, with mouths that open as wide as five feet—but since they only eat plankton, it’s safe as can be to swim alongside them. The black-and-white spotted behemoths come to the waters off of Punta Sam each summer to feed, from mid-May through September. You can opt for a daylong snorkeling trip with Swim With Whale Sharks or a multi-day outing with Natural Habitat Adventures. These small sharks are named for their buttery yellow skin color. Most grow no larger than 12 feet long, but they have been known to attack humans—though it’s usually attributed to fright rather than aggression. 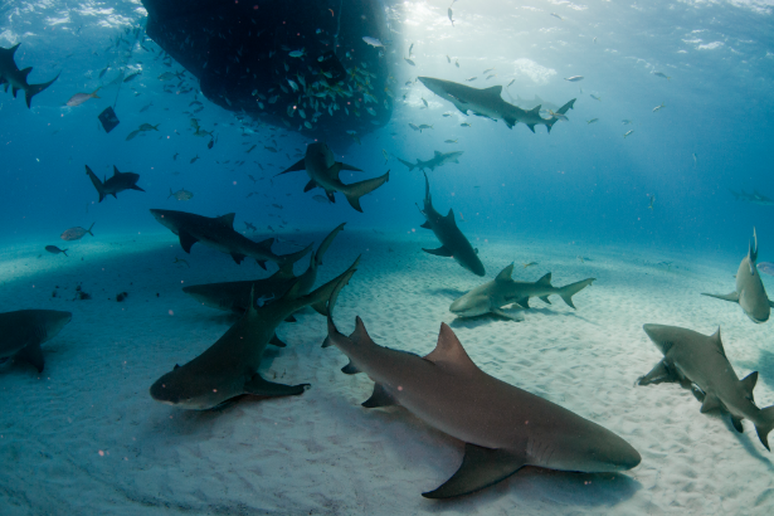 Lemon sharks are found mostly off the coast of the southeastern United States and also in the Gulf of Mexico. Jupiter Dive Center, out of Jupiter, Florida, just north of West Palm Beach, offers daylong diving trips to the Florida Reef, a favorite Lemon homesite. Sneaking up on a hammerhead is next to impossible: Thanks to the positioning of their eyes—set on the sides of their distinctive hammer-shaped snout—they have virtual 360-degree vision. That’s why it’s best to get help from the experts if you hope to spot one in the wild. 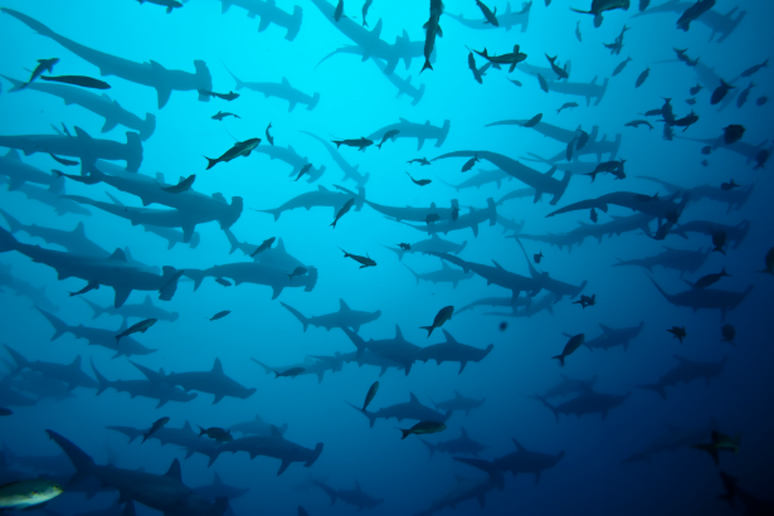 The folks at Quasar Expeditions have homed in on specific locations, including Wolf Island, in the Galapagos chain, off of Ecuador, where divers can swim alongside schools of hundreds of hammerheads. These sharks, which can grow up to 14 feet in length, can be spotted year-round in this area. Diving excursions are an optional add-on to all cruise expeditions with Quasar Expeditions, while Galapagos Diving offers more scuba-intensive weeklong trips. Few marine creatures are as intimidating as the bull shark. The carnivorous fish grow 11.5 feet in length and 500 pounds in weight. Scientists consider them one of the most aggressive and predatory species in the sea. 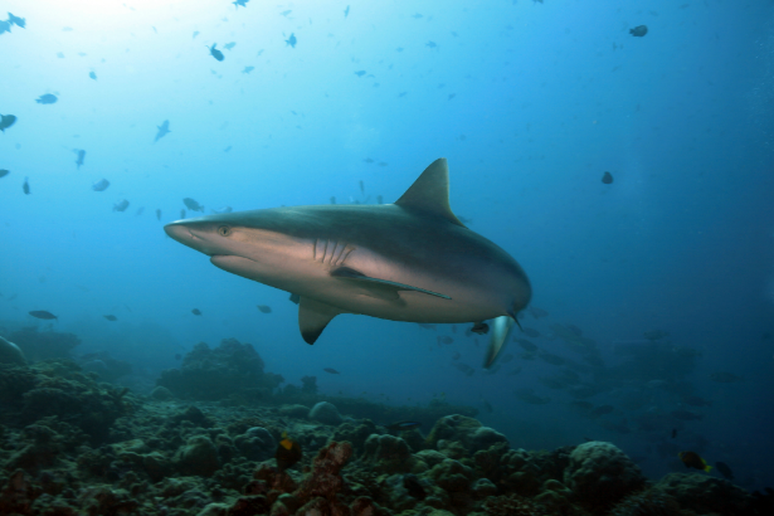 That may be enough warning for most to stay away, but if flirting with deep-sea danger appeals, then you can sign up for Beqa Adventure Divers’ day-long Shark Dive outings in the protected waters off of Fiji. June is peak season for spotting these migratory animals, though they arrive in the waters off of Fiji as early as mid-May. 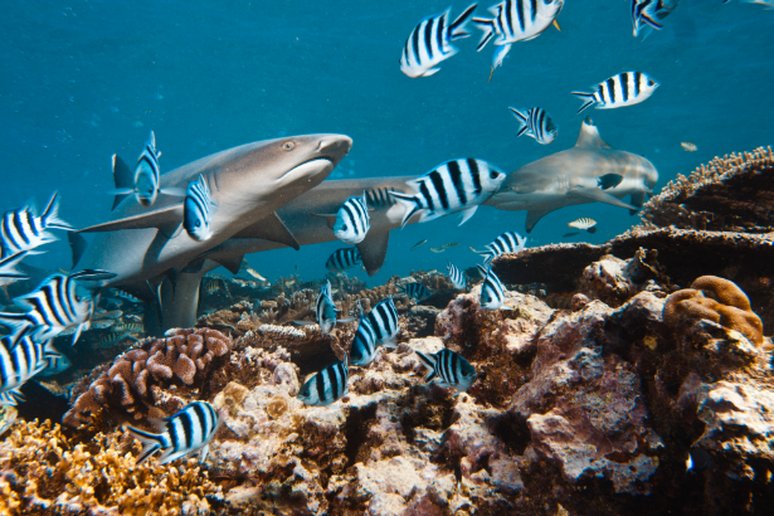 You might also spot grey reef sharks, Pacific blacktips, whitetip reef sharks, sicklefin lemon sharks, silvertips, tawny nurse sharks and Fiji tiger sharks here this time of year. Second only to Great Whites in attacking humans, tiger sharks have a well-deserved reputation as predators. But it’s not people—or even smaller fish—that they’re specifically after. Tiger sharks have a very undiscerning palette and will chomp down just about anything. Studies of captured tiger sharks have found everything from license plates to old tires in their stomachs. They’re called the Wastebaskets of the Sea for a reason. 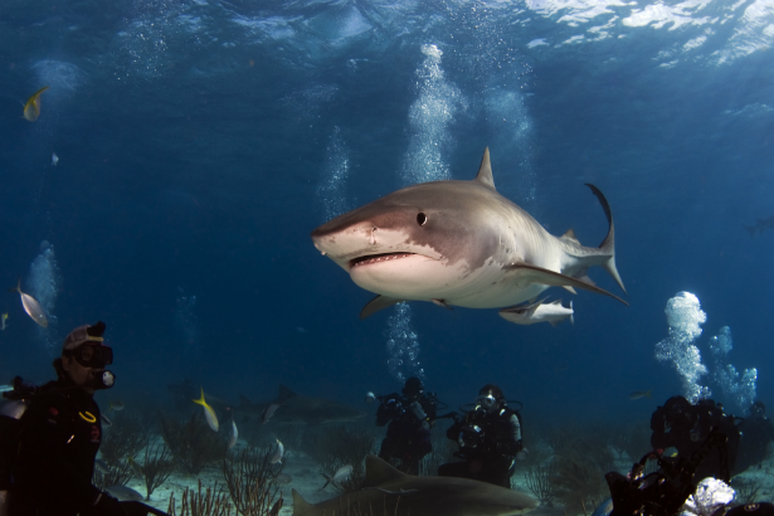 The Bahamas-based Shark Diver outfit offers seven-day sailing and scuba trips out of Grand Bahamas Island aboard a 65-foot dive vessel. 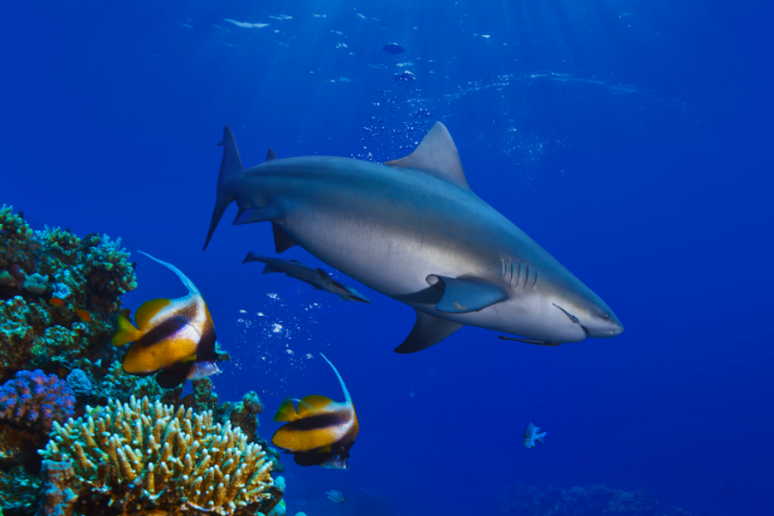 Along with tigers, you may see Caribbean Reef sharks and eagle rays. These nocturnal creatures spend their days snoozing in reef caves. Due to their small size—they rarely grow longer than 5.5 feet—Whitetips usually share sleeping quarters; divers may happen upon several stacked on top of each other in one cave. Oahu Diving offers day trips around the island, including excursions to Sharks Cove, off the North Shore, near Haleiwa.